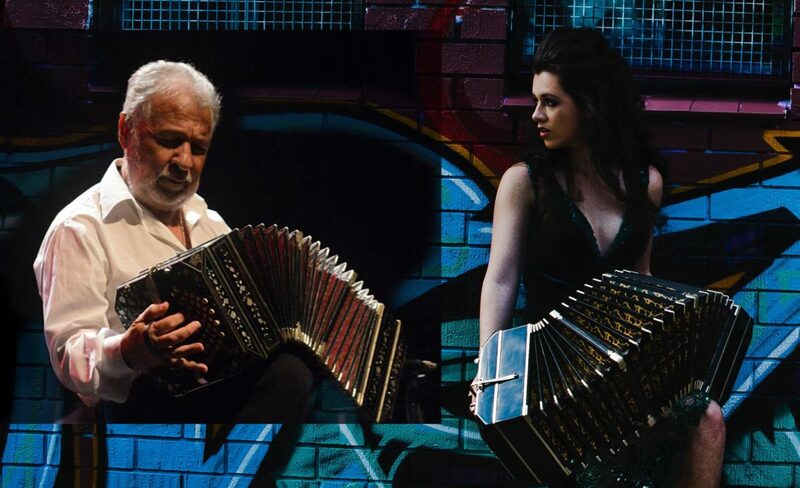 An afternoon concert of world-class Tango music with Bandoneonist Nestor Vaz and Pianist/Bandoneonist Emily-Rose Šárkova, as part of the Tango in the Spring festival. Plus pre-concert talk. Emily-Rose is the Artistic Director of Australia’s premiere tango quintet, Tángalo, and she has put together a fantastic concert program with Nestor Vaz: intimate duo concert pieces. This unplugged acoustic concert will feature works by Piazzolla especially arranged for the duo, as well as double bandoneon piecs, some beautiful songs and haunting solo pieces. There will be a 30 minute pre-concert talk on the origins of tango in Uruguay and Argentina, and the Rio de la Plata. Admission: free, but please arrive early to make sure you get a seat. NB the venue will be set up in concert mode, without a dance floor. Supported by the Embassy of Uruguay in Australia, and the Australian National Centre for Latin American Studies (ANCLAS). 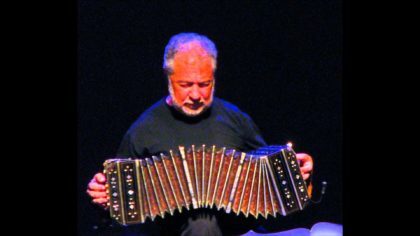 Nestor Vaz, from Montivideo, Uruguay and is a bandoneonist of considerable repute. Born in 1948, Nestor has performed on the bandoneon since the age of 14, beginning in orchestras from Uruguay. With many years of collaborations under his belt (as well as a degree in geology! ), Nester has dedicated a huge part of his life to the music from the Rio de La Plata region of Argentina and Uruguay and also to the music of the great Astor Piazzolla. His activities as bandoneonist, musical director and arranger have taken him on tour to a vast number of international locations: Spain, Germany, France, Mexico, Argentina, Portugal, Canada, the Untited States and even Finland. His collaborations are too numerous to list, however amongst them are acting as arranger and musical director of the great singer Gustavo Nocetti as well as such spectacular events as Avenida Bandoneón, accompanying such tango singers as Ledo Urrutia, Alberto Rivero and Marlene Otero, argentine singers including Raúl Lavié and Eduardo Espinosa, and recording alongside many great musicians & singers of popular Uruguayan music from Rock to Candombe (the jazz of the Uruguayan street bands). When he is not playing with ensembles such as Quinteto Imperial, Tango por dos and Tango 4, you may find him being a soloist in the Montevideo Municipal Symphonic Orchestra or first bandoneonist in the tango galas of Montevideo Philharmonic Orchestra. As well as being declared ‘the most illustrious citizen of the Municpality of Florida, Urugay’, he has also recently released to great acclaim a new album of original compositions entitled ‘Tango Suites’ and finished a season of ‘Hommage a Astor Piazzolla’ in Montreal, Canada. Emily-Rose is one of Australia’s most dynamic and versatile young musicians and tango dancers. A graduate in classical piano from the Sydney Conservatorium of Music, Emily-Rose’s is also skilled in Piano accordion, Voice, composition and has recently added the argentine tango instrument, Bandoneón, to her multi-instrumentalist palette. During her formal training she was fortunate enough to undertake masterclasses in France and study in Germany for a year on scholarship. Since graduating in 2010 she has continued as a founding member of enchanting world music group Chaika, established highly successful Tango Quintet ‘Tángalo’ and formed a dynamic classical duo with soprano Susie Bishop. It has been said about Tángalo: “Chamber music on steroids: 4 ½ out of 5 stars.” – John Shand, Sydney Morning Herald, 2015. Emily-Rose has been invited to perform with Aria award winning group ‘Monsieur Camembert’, the Australian Brandenburg Orchestra and with renowned early music ensemble ‘The Marais Project’. Emily-Rose has toured internationally to Poland with the Klezmer Divas and in 2014 she undertook a project with Tángalo in conjunction with the Australian Council JUMP mentorship grant. This involved study and performance in Buenos Aires, Argentina and an extensive Australian tour with Latin Grammy nominated duo ‘Duo Ramirez-Satorre’. Emily-Rose is also a skilled Argentine tango dancer and runs Sydney Tango House with her partner, Refik Unluer. She has studied in depth with such maestros as Moira Castellano, Gaston Torelli, Eugenia Parilla and Mariana Dragone. Emily-Rose’s travels and diverse experiences flavour all aspects of her performance and teaching, making her open minded, creative and highly skilled as both a performer & teacher.